In January 2018 our company obtained the quality management standard according to EN ISO 9001:2016. The AMPER 2017 Fair in Brno was a great success for us. The interest in free PROMOTIC SCADA workshops that took place in the classroom directly on our stand was enormous. 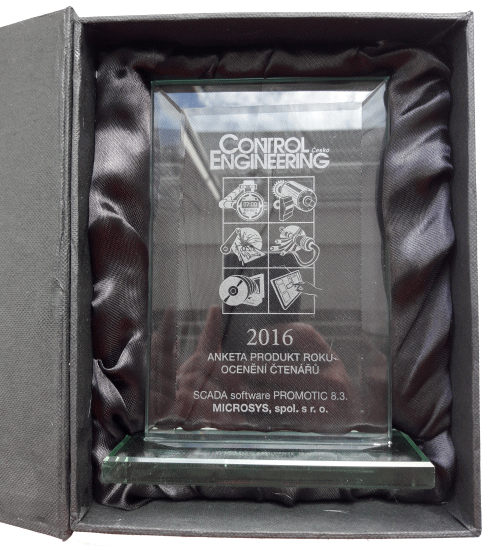 However, our joy was even greater following the announcement of the results of the "Product of the Year 2016" competition, which is traditionally announced by the Control Engineering Czech magazine. We thank all the voters and we greatly appreciate the kindred of our users who have been faithful to the PROMOTIC SCADA system for more than 25 years. Throughout this time, PROMOTIC system is undergoing constant technological development, which would be impossible without users and their inspirational feedback. We look forward to further growth with you. 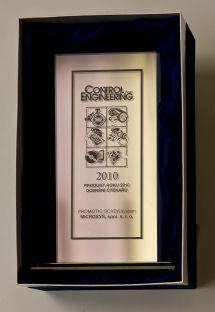 We are proud to announce that thanks to your support in the poll held by Control engineering Czech magazine - "Product of the yeat 2010", the PROMOTIC SCADA system was victorious in its cathegory. Thank You very much! presented by the global rating and consultant company Frost&Sullivan. Award, SCADA market penetration report.